Read a map based on Titanic’s log positions. Map the route of Titanic until it sank. Log all the iceberg locations. From what distance could the iceberg be seen? How did the ship’s speed affect the ability of the crew to avoid the icebergs once they were spotted? 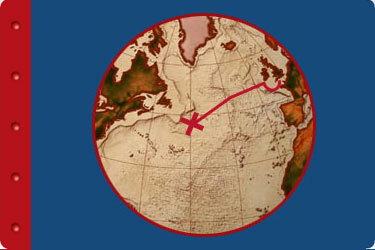 Using a map of the world, locate and label key locations in Titanic’s history: Belfast, Ireland; Southampton, England; Cherbourg, France; Queenstown (Cobh), Ireland; Greenland’s west coast; Labrador, Canada; New York, USA. Explain why the city of Cobh, Ireland, was renamed Queenstown? When was its name changed, and what is the name of the city today? Explain the importance of each of the locations above: where Titanic was built, ports where passengers came aboard, where the iceberg formed and its path, where the ship sank, where Titanic would have put into port had the voyage been successful. Also, locate Halifax, Nova Scotia, where many of the bodies are buried.